Quality Aircraft was started by Shirley & Dennis Lauterbach in 1970. His background in aviation began with his father as a crop duster and an airplane dealer. Dennis flew many different types of fixed winged aircraft from the time he got his pilots license in 1967 but in 1980, something caught his attention. The thought of getting into his first helicopter, and that's exactly what he did. It was a Bell 206 Long Ranger ~ and it was history from there. After selling the first Long Ranger he owned, he replaced it with yet another Long Ranger and with it, got the first radio contract in Dallas with Eagle 97 KEGL aka 97.1 ~ The Eagle. The station wanted a catchy name for the chopper and at the time, the movie "Blue Thunder" was popular. Since that name was taken and the helicopter was solid black, "Black Thunder" was born. Gail Lightfoot was the infamous traffic reporter in the chopper and Clarence J. Lott was the pilot. Dennis went on the be involved with multiple radio stations in the D/FW area such as 1080 KRLD which, at the time was the radio station for the Dallas Cowboys, and with 103.7 KVIL. 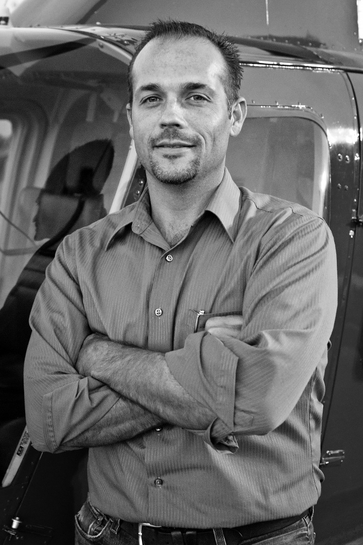 During this time, Dennis bought, rebuilt and sold many Bell 206 helicopters. Make sure you click on the Services link to see the other areas that Quality Aircraft is involved in today. Dennis, Jr., Dennis and Shirley's son, began working with Quality Aircraft full time in 1994. He got his pilots license but had many flight hours before that time, co-piloting aircraft around the D/FW metroplex and the U.S. with his father. After getting his private pilots license in fixed wing, he went on to get his ticket in rotorcraft and today holds a private ticket - fixed wing and a commercial ticket in Rotorcraft. He was one of the commercial pilots on the FAA Part 135 ~ Air Carrier certicate at Quality Aircraft and also is the Director of Maintenance there as well.